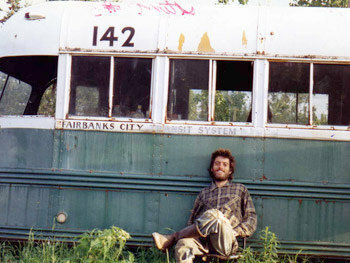 I want to be a modified version of Christopher McCandless…and I hopefully will start my own journey in my magic bus…really soon isa…leaving my family behind…my “supposed to be” friends…and the land I was born in…Egypt. Yesterday alone in Nile City I saw the movie I was waiting for...a movie that filled all my eyes with tears…a movie that refilled my heart with hope…and a movie that reemphasized the fact that cinema changes lives. I’m not going to talk about the movie…I just want to say that this is the best feature Sean Penn has ever directed…just looking to the beautiful long shots of nature one can immediately realize the poetry hidden behind it and the art of cinematography Penn has obviously gained after the long editing time he spent with the legendary director Terrence Malick. Every song was put exactly in its right place…with the lyrics giving more depth and softness to the storytelling process…every actor gave his best- especially Hirsh and Hoolbrook- to portray the real events that Krakauer has captured in his non-fictional best selling book...and every scene was an alarm for me to restart and think about the way I want my life to look like. Through all the chapters of Chris’s adventures you are totally sucked into his controversial ideas…ideas that can’t come from a well educated and civilized man…yet the director succeeded in letting us unconsciously sympathize with this “idiot” hero…not because of his courage or rebellion…but because of the truth and purity that lies beneath all his actions. Oprah’s show about the film is also a must see to get the whole picture of Chris’s life from people who knew Chris in real life…and to fully understand why he did this. “Into the Wild” is simply a quiet gentle protest against the world of today...the world of destruction, poverty, materialism, religion, control, unfairness, power and organizations. You was not born as a slave in the cages of communities…you was born free…to live in the wild world. There is one last chance for people in Egypt to go and see this movie that will be shown one last time during the Cairo International Film Festival this week – and for god sake leave this bad habit that can only be seen in citizens from developing countries…people that say yeah ok I’ll download it from the internet and see it on my PC – cinema is an experience ya gama3a…and this movie in particular is a beautiful experience that you need to have inside a theatre…and I am sure you will then come out of the dark room to the “city of blinding lights” wondering how and why you are still living in this damn society. Wonderful post. I just felt like that when I saw the movie but you expressed it better. Oh thank you Rahina...finally someone has read this and understand what I want to say...I also wanna say that I did what I wrote back then in this post...I can't believe I have made my dream come true and moved from my country Egypt to a new world...to start a new life...a fee life...my life. رأيى أنه كان مغرور.. وأعمى.. لانه افتكر ان فكرته زى ما رفعته عن المجتمع فهى ممكن ترفعه عنالناس كلهم..